It focuses on the titular Bear and his varied friends: a tiny mouse named Tutter, a baby bear, Ojo, two otters, Pip and Pop, and a lemur with a speech impediment who goes by Treelo. They all live together in a, yes, big blue house. The episodes tend to deal with simple problems for the friends to help each other with structured around a theme to learn about, things like seasons or shapes or color. Bear is the ‘adult’ character of the group, and often has to gently and kindly show the others how to do something, or why they shouldn't worry about a problem. I am actually pleasantly surprised how well this holds up. We enjoyed it, although it is definitely targeted toward young kids. 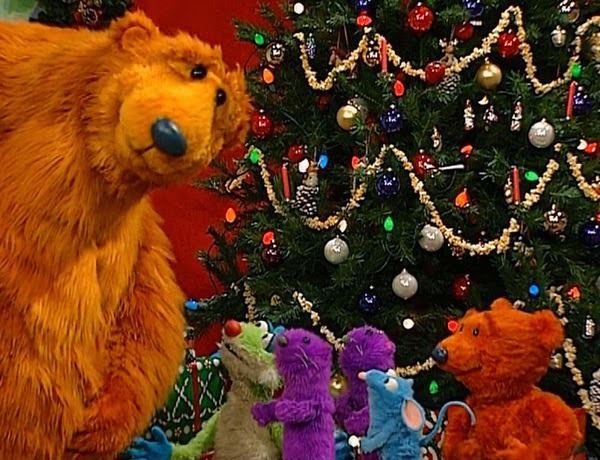 It has a lot of direct address (Bear welcomes you to the Big Blue House at the start of each episode) and each episode has a consistent, expected structure. This double-length episode is about the holidays. After a special opening musical number, Bear welcomes you in, compliments how festive you smell (I turned to Erin and said ‘I think I just got hit on by a giant Muppet bear’), and then introduces the theme of the episode. In the first five minutes, this show demonstrates a more comprehensive knowledge of the origins and relationships between the winter holidays than most adults, capping it off with another song: ‘A Holiday for Everyone’. By the way, the music is really well done for a kid's show. Some of the songs are gorgeous and slow and haunting, some fast and hilarious. I should mention here a character I haven’t named yet. Bear has a friend called Shadow, who is a literal shadow. She pops in once an episode to tell a story with shadow puppets. These segments don’t have as nice production values as the rest, but we get a bit about Kwanzaa in the first half, and Hanukkah in the second. Not bad. After a detour to visit Santa Hog at the mall and another fun song, we get to the crux of the holiday plot: the inhabitants of the house discover a dog, dying in the snow. They take him in, discover that he's homeless, and insist he stay with them for the holidays. Tutter the mouse sings a quite moving song grappling in a childlike way with the idea of homelessness. He feels empathy, but he’s also suddenly worried about losing his own home. By the end, of course, Jake the Dog finds a new home, and all the characters have tried to be kind to each other. Also there’s a whole sub-plot in the second half about the annual search for a magical wish-granting Winter Berry. I really enjoyed that the Winter Berry isn’t proven to be either magical or not magical. It’s a nice subtle touch - the animals have a holiday tradition that involves a myth and magic, they believe, but it isn’t proven true. I just found this whole special sweet. But there’s one more character I’m forgetting. At the end of every normal episode, and in this case both halfway through and at the end, Bear recaps the events of the day to Luna. The moon. The actual moon. He flirts with her. The Bear is in love with the Moon. It’s sort of mystical and beautiful, while STILL being a kids show from the late 90s. If you like puppetry and you appreciate children’s television that’s sweet without being cloying, you should consider looking this up. Better yet if you have little ones.